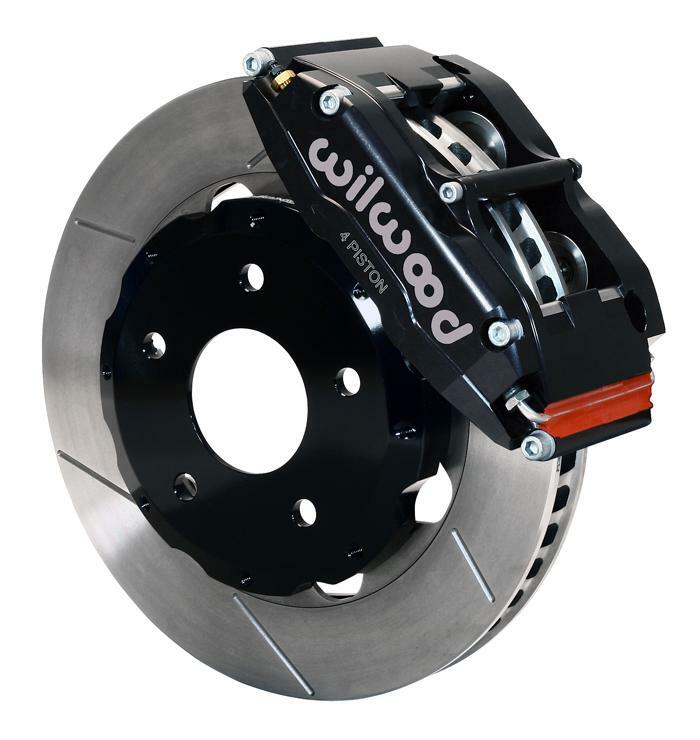 Wilwood Engineering Brake Kit - Road Racing - Dezod Motorsports Inc - Home of the automotive performance enthusiast since 2002. Kits in this competition group are configured for use in production category road racing that allow brake upgrades, but limit modifications to four-piston calipers and 12.20” rotors. BSL4R/ST calipers use Thermlock pistons to resist fade and extend service life by reducing the heat transfer into the caliper from the pads. GT series directional vane rotors provide high cooling efficiency and durability mounted to the hubs with forged aluminum GT hats. Kits also include high temperature race compound pads, stainless steel flexlines, and premium grade hardware for installation in 16” and larger wheels. Kits in this competition group are configured for use in unrestricted class road racing with 17” or larger wheels. BSL6R/ST six-piston calipers with Thermlock pistons are matched with 12.90” directional vane GT competition rotors. These proven winners have delivered championship performance in road racings’ most grueling production car categories. Rotors mount to the hubs with forged aluminum hats and radial mount brackets secure the calipers to the OE location without modification. Kits also include high friction race compound pads, premium grade hardware, and stainless steel braided flexlines. W4AR/ST four piston radial mount calipers are coupled with the high cooling capacity of 14.00” SV-GT staggered directional vane rotors to provide the ultimate brake package for unrestricted road race competition. Thermlock pistons in the calipers resist fade and extend service life by reducing the heat transfer from the pads, caliper body, fluid, and seals. Rotors mount to the hubs with forged aluminum hats and radial mount brackets secure the caliper to the spindle in the OE location without modification. Kits also include high temperature, high friction race compound pads and all premium grade fasteners. W6AR/ST six piston radial mount calipers are coupled with the high cooling capacity of 14.25” SV-GT staggered directional vane rotors to provide the ultimate brake package for unrestricted road race competition. Thermlock pistons in the calipers resist fade and extend service life by reducing the heat transfer from the pads, caliper body, fluid, and seals. Rotors mount to the hubs with forged aluminum hats and radial mount brackets secure the caliper to the spindle in the OE location without modification. Kits also include high temperature, high friction race compound pads and all premium grade fasteners. Forged Narrow Superlite 4R caliper rear road race kits provide matched performance in conjunction with FSL6R and W6AR front race kits on vehicles built specifically for competition. BSL4R calipers use stainless steel pistons to retard heat transfer from the pads and high temperature seals for reliability in sustained high heat. Radial mount brackets attach the caliper in the stock location. GT series directional vane competition rotors provide high efficiency cooling and mount to the drive axles with forged aluminum hats. Kits also include high temperature, high friction race compound pads and all premium grade fasteners.